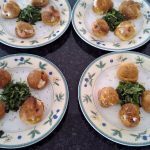 Welcome to my recipes for 2016, Each week my daughter and I cook a new recipe based on an ingredient in my French Market shop or just something that inspires us. 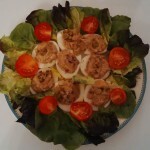 Please click on the links below to get to the recipe page. 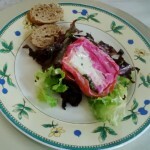 Do email me if you have any questions at suzanne@frenchmarket.co.za Have fun and enjoy the food. 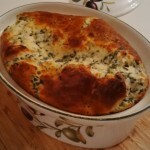 Suzanne’s Recipe 05-2016 Tarte Peche Nichole. 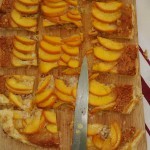 Made with the ripest peaches and a frangipane base this delicious tart is ideal for a summer lunch. Created 31January 2016. 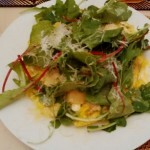 Suzanne’s recipe 06 – 2016 Salade de chevre chaud et figues. 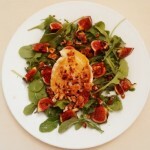 A decorative and easy to make salad of warm goat’s cheese, fresh figs, rocket topped with toastedwalnuts. Creaated 11th February 2016. 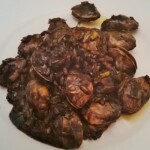 Suzanne’s recipe 08 – 2016 Risotto vongole con sepia nero. This black coloured risotto is made with squid ink and small clams and has a delicate fish flavour. Created 25th February 2016. 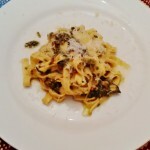 Suzanne’s recipe 09 – 2016 Tagliatelle avec Pesto du Jardin. 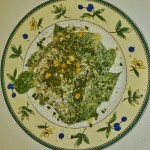 A traditional and simple pesto genovese recipe made with fresh basil from the gardin, toasted pine nuts, garlic and aged Parmigiano Reggiano. Created 3rd March 2016.